This multi-frequency universal receiver has 2 optocoupled outputs, with 60V and 50mA capability, and can be supplied from 5Vdc to 36Vdc, and from 7Vac to 27Vac. Frequency can be setup easily using the Prog button, as like as the output that can be configured, indipendently for each channel, to hold-to-run, bistable, bistable ON/OFF and timer from 0.5s to 60 minutes. 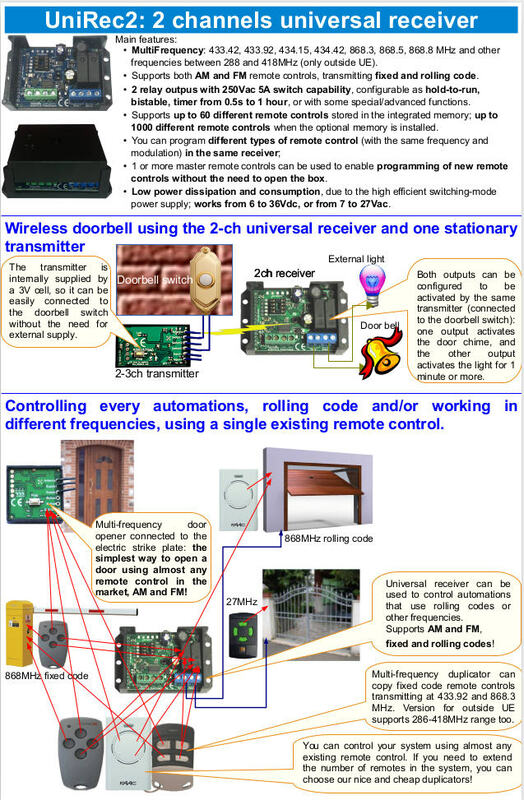 It supports up to 60 different remote controls in the same receiver, both fixed and rolling code, AM and FM: the maximum number depends by the code length. Also, it can receive in one or two different frequencies, even with different modulation: for example it can be programmed to manage remote controls working in both AM 433.92 MHz and FM 868.8 MHz. 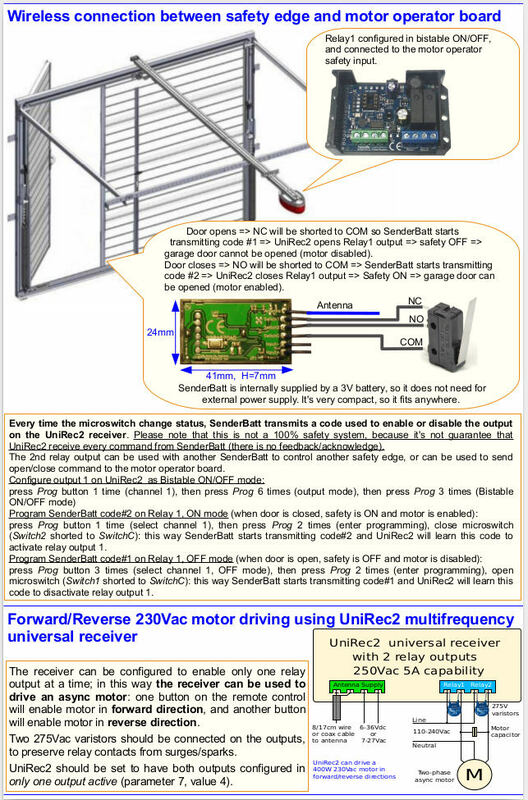 Creasol UniRec12 can be used to control an electronic board with two pushbutton inputs, or two electronic boards with one pushbutton input/each: for example it can be used to replace non-working receiver in a gate motor driver, or to add a different set of remote controls to an old automation working on low frequencies or using different codings. control other different automations by using one channel of Creasol UniRec12. This device is not suitable to control power loads such as garden lights, motors, pump: in this case it's possible to use Creasol UniRec2. Can be supplied from 5 to 36Vdc and from 7 to 27Vac. Low voltage and current contact rating: outputs support up to 60V and 50mA.